Doesn't Glory the Fig look fabulous? In late fall, water houseplants sparingly until the light begins to increase in the new year. 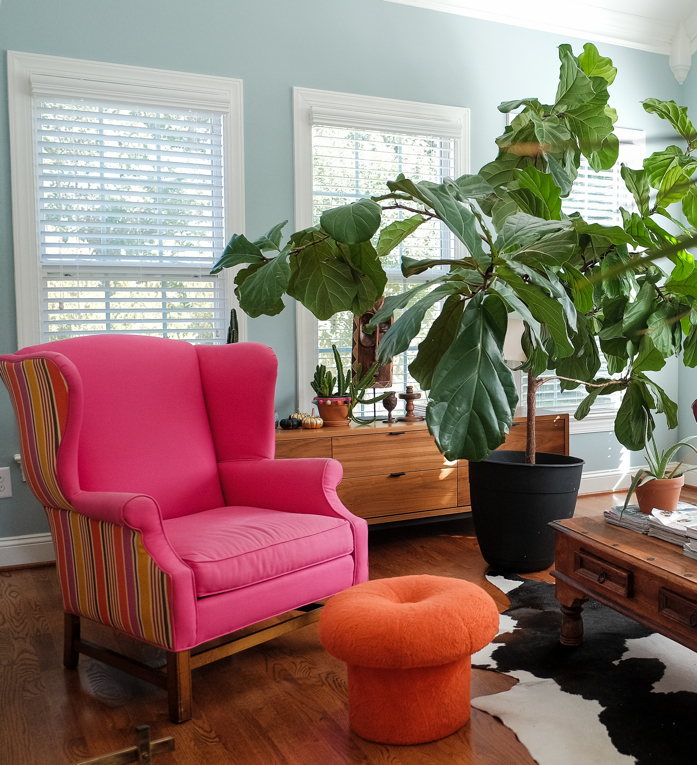 More houseplants die from overwatering than from anything else. Water plants with room-temperature water. Water houseplants in unglazed clay pots frequently. 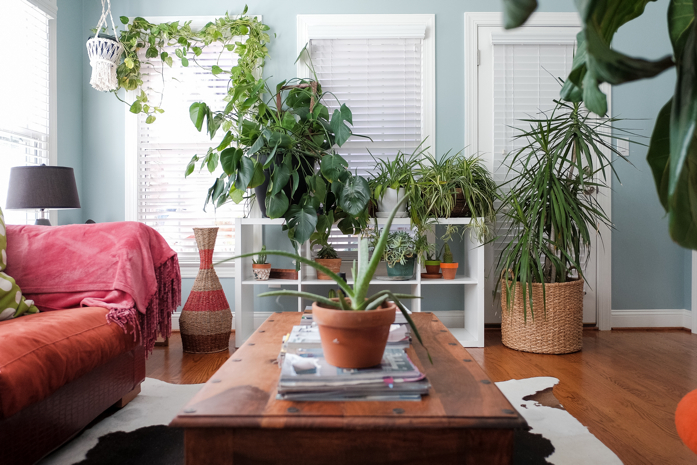 If your houseplant leaves are dripping, even when you haven’t watered, it’s trying to rid itself of excess water (a process called “guttation”). This makes a plant vulnerable to disease-causing bacteria, so you’ll want to avoid this problem by reducing the amount of water you’re giving the plant, especially in winter months. Also, watch those drips because they contain salts, sugars, and other organics that could stain whatever it is they’re dripping on. 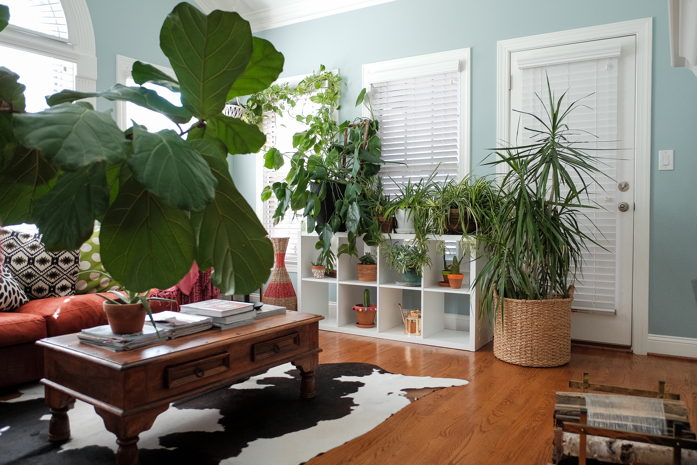 Most houseplants are happiest when the relative humidity is 50 percent or higher. In winter, feed sparingly; house plants will be sensitive to overfeeding at this time of year. It’s also good to bring in plants before you start heating your home. This gives them a chance to adjust. Wash them thoroughly before bringing them in to rid them of any pests and eggs. You can also dig up your rosemary, basil, tarragon, oregano, marjoram, English thyme, parsley, and chives to grow them inside as houseplants. Keep them in a cool, sunny spot, and allow the soil to dry out before watering. Snip off the leaves as needed in the kitchen, but do not strip them completely. If your plants seem a little worse for the winter, provide lots of sunlight, fresh air, and frequent bathing. Agree with all of these tips especially the water! I didn't know about the garlic, will do that today! Thank you Stacey! Thank you so much for all of this information, Stacey! Thank you for all your tips, Stacey! They're really useful for me. Hope to see more posts about houseplants from you. Great help..putting my indoor window unit together now. Then will snuggle my plants. Except the succulents they like cold.